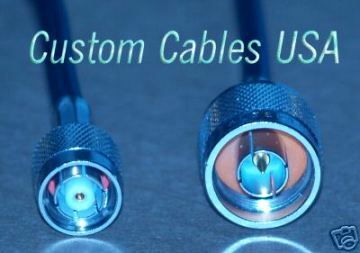 We make custom RF/Radio/Microwave/WLAN WiFi coax cables to meet YOUR needs! FAST shipping, Easy payment, and LOWEST market Prices! 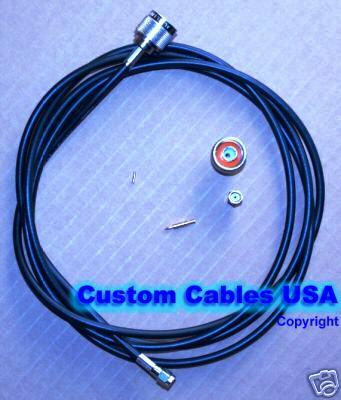 RG58 / LMR195 series Cables: We make Custom RF/WiFi Coaxial Cables / Pigtail/Jumpers for your special needs! For WiFi applications: Signal loss for our 10 foot low-loss RG-58 (LMR195 equiv.) cable is about 1.9 db, and 3.8 db with a 20 foot. For cables over 12 feet, may we suggest that you use the ultra-low-loss LMR400, LMR400UF or LMR600 to help limit the amount of WiFi signal loss (i.e. obtain more signal strength), if that would be an important factor for your application. ultra-low-loss LMR-400 to help limit the amount of WiFi signal loss (i.e. to obtain more signal strength), if that would be important for your application. ultra-low-loss LMR-400 to help limit the amount of WiFi signal loss (i.e. to obtain more signal strength), if that would be important for your application (with cables over 12 feet). Other coax cables, connectors/adapters, etc. - Contact Us. Home | Policy | Contact Us | Copyright © 2008 Custom Cables USA LLC. All rights reserved.